Anyone who has ever seen a kid fasten a towel or blanket around their neck to create a cape and instantly become a superhero knows how little it takes to make a child's imagination soar. That's the brilliance behind Brooklyn Owl's Unicorn Horns... they're a small but mighty accessory that will open countless new portals full of magical make believe. 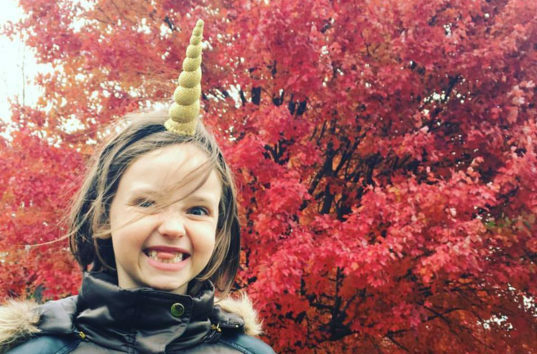 Unicorn horns are handmade in Brooklyn by Brooklyn Owl small business owner and mom Annie Bruce and her team of seamstresses. The unicorn horn accessory was designed by Annie and her daughter Bee when Bee was just 4 years-old. Initially the mother-daughter duo were the only pair who donned unicorn horns on playdates and around town. But observers and friends began to take notice, and they wanted in on the merriment too! Now Annie and Bee are “on a mission to create products that inspire young girls and women, make the world more whimsical and inspire people of all ages to follow their magic!” And most importantly, they’ve brought unicorn horn wearing fun to the masses. Unicorn horns are available in every color of the rainbow in sparkle or felt fabric… and if you can’t decide which color you’d like, you can get them all via a rainbow patterned horn. Sizes range from mini size at 1.7 inches tall, to tween size at 3.5 inches tall, to the original size of 5 inches tall. Brooklyn Owl even makes large unicorn horns that will fit real ponies and horses. Also available: unicorn horn and ears sets. These playful toppers make wonderful stocking stuffers and birthday gifts — but we don’t think you need a special occasion to decide to gallop off into the proverbial sunset with the magic of a unicorn atop your noggin and in your soul. Unicorn horns are handmade in Brooklyn by Brooklyn Owl small business owner and mom Annie Bruce and her team of seamstresses. The unicorn horn accessory was designed by Annie and her daughter Bee when Bee was just 4 years-old. Initially the mother-daughter duo were the only pair who donned unicorn horns on playdates and around town. But observers and friends began to take notice, and they wanted in on the merriment too! Now Annie and Bee are "on a mission to create products that inspire young girls and women, make the world more whimsical and inspire people of all ages to follow their magic!" And most importantly, they've brought unicorn horn wearing fun to the masses. Unicorn Animal Hat will Turn Winter into a Wonderland Unicorn horns are available in every color of the rainbow in sparkle or felt fabric... and if you can't decide which color you'd like, you can get them all via a rainbow patterned horn. Sizes range from mini size at 1.7 inches tall, to tween size at 3.5 inches tall, to the original size of 5 inches tall. Brooklyn Owl even makes large unicorn horns that will fit real ponies and horses. These playful toppers make wonderful stocking stuffers and birthday gifts -- but we don't think you need a special occasion to decide to gallop off into the proverbial sunset with the magic of a unicorn atop your noggin and in your soul. Also available: unicorn horn and ears sets.